Kids Truck Tool Set Just $27.94! Down From $60! PLUS FREE Shipping! You are here: Home / Great Deals / Amazon Deals / Kids Truck Tool Set Just $27.94! Down From $60! PLUS FREE Shipping! At Amazon, you can get this Kids Truck Tool Set for just $27.94 down from $59.94 PLUS FREE shipping! With the WolVol Kids Truck Tool Set, there won’t be anymore a messy toy room while you can keep the tools neat in the electric toy truck and have fun playing with tools and vehicle activities at once. Pretend and play real construction work while hammering the nails and screws in the truck with all the equipped tools. The additional feature of Bump and Go will make this a hit to the little one. Simply turn the switch on and let it go around the house. It will drive as if a human is driving it, when it bumps into something it will change to the other direction. 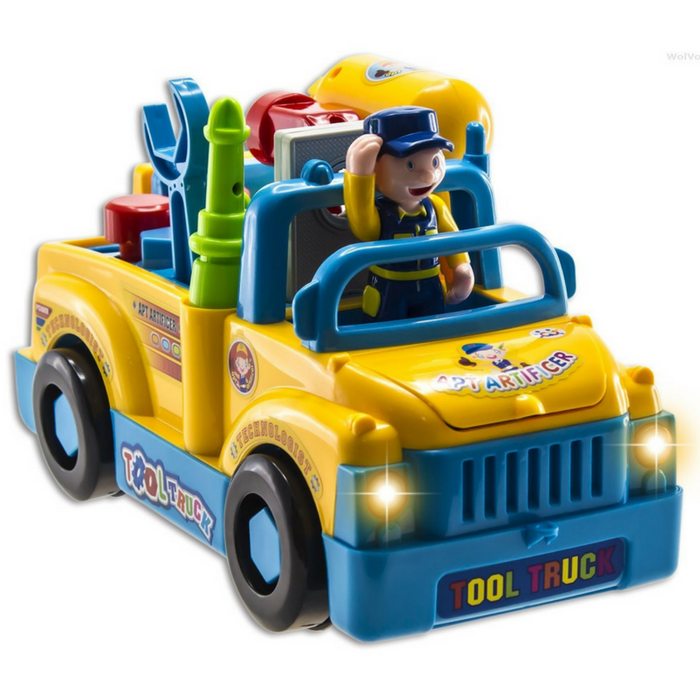 This bump and go truck toy has an additional feature which you can turn the bump and go action OFF and the bump and go wheel will go in, so that the kids can play with it as a regular vehicle toy without the bump and go wheel disturbing. Hours of fun and entertainment. It is the perfect idea for Gifts, Birthday Presents, Christmas Gifts, etc.